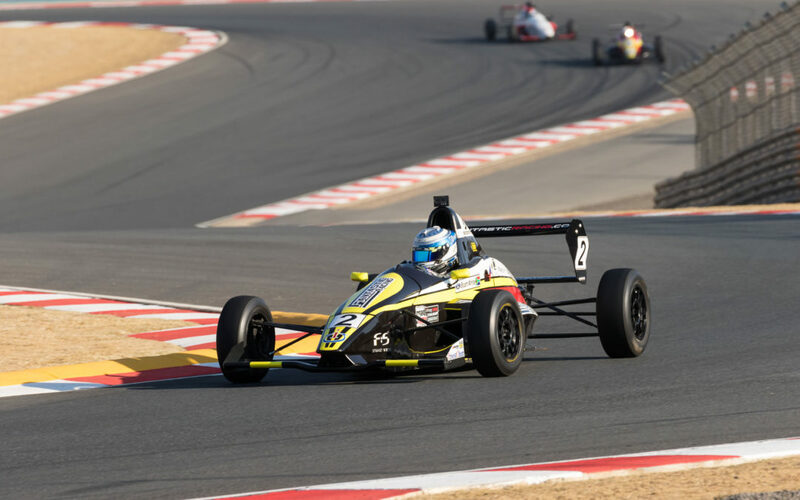 Bloemfontein teenager Stuart White has one hand on the big prize as the Investchem Formula 1600 championship on the Road to Indy returns to Killarney in Cape Town for the penultimate round of the championship 22 September. White (Fantastic Racing Mygale) has a 22-point championship lead over Nicholas van Weely (Magnificent Paints & Hardware van Diemen), which means that Stuart just needs to score just a single point more than Nicholas to clinch the title and bag that Road to Indy prize. It’s been an intriguing season so fas as White and van Weely shared race wins through the season, with White winning the four opening races at Kyalami’s season opener and round 2 at Killarney, before van Weely took control of the next four rounds at Zwartkops and East London. The duo then shared the race wins and second places in soaking wet Port Elizabeth before the battle moved on to Zwartkops, where Scott Temple(Road to Race Mygale) won both races but White beat van Weely, before White swept the board at Kyalami last time out. Temple is meanwhile involved in a close tussle for that championship third with Alex Gillespie (ERP Trucking Components Mygale), while Andrew Schofield (Investchem Mygale) sits comfortably behind them. There’s a most interesting title tussle next up between young guns Tiago Rebelo (TRMS Mygale), Siyabonga Mankonkwana (Cervinia Investments/Max Q Mygale) and local lad Andrew Rackstraw (Investchem/RDSA Mygale). Rebelo scored a maiden podium last time out, but Rackstraw and Mankonkwana are both due a break, while another Cape driver, Joshua Dolinschek (Makita Mygale) and Brendan Tracey (Investchem Mygale) are right in there too.